CiderDays is an annual community celebration of all things apple in beautiful Franklin County, Massachusetts. 2017 marks their 23rd year with tours, cidermaking and tastings, workshops and much more in orchards and venues county-wide from Ashfield, Deerfield, Turners Falls, Charlemont and Colrain to New Salem and the towns in between. Whether you are a cider aficianado (hard or sweet), make your own cider, are an orchardist, like hanging out in bucolic orchards, or just enjoy soaking up all the goodness of autumn in New England, CiderDays is a pretty cool event. To find out more – we welcome Al Sax from the CiderDays committee and home hard cider maker, April Woodard. Today we’re going to explore the world of hard ciders with three regional distillers. From the tart and tangy, to the sweet and crisp, this refreshing effervescent beverage is the perfect way to whet your whistle on a hot summer’s day. Jason Grizzanti is co-owner and Master Distiller of Warwick Valley Winery and Distillery located in Warwick, NY. Casey Vitti is co-founder and cellar master at Awestruck Ciders in Walton, NY. April is a month for changes. As trees bud, the maple season ends, but apple blossoms soon emerge. It’s a time when orchardists carefully watch the temperatures. If they drop too low while apple trees are budding, it can damage the crop. With the fluctuating temperatures over the past week, some apple growers are concerned that their trees are at risk, while others say it’s too early to wave warning flags. A couple hundred years ago. hard apple cider used to be the drink of choice for thirsty Americans. It was easy to make and easy to find. But as people moved into cities, and beer became more popular, cider fell out of fashion. Now it's come roaring back. U.S. hard cider sales are up 65 percent over last year, and just about all the big beer companies sell it, as well as many artisan brewers. Finding cider at your local bar is often no longer a problem. 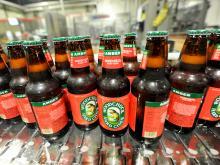 American hard cider is making a comeback. There are many high hopes for the industry, which has gotten the welcome mat from New York's chief executive. A new law that will take effect early next year creates a new type of license for farm cider-making operations. Sonya del Peral is manager of Albany's Nine Pin Cider Works Company. She agrees with New York Governor Andrew Cuomo, who believes that the farm cider operations, which can sell other products such as jams and souvenirs, will promote tourism and help New York agriculture.